Even before she began her remarks to members of the Siesta Key Association (SKA), Lee Hayes Byron was garnering a considerable amount of attention from the folks gathering in the Parish Hall of St. Boniface Episcopal Church for the organization’s Feb. 4 meeting. As Byron told the approximately 70 people just a short while later, the green bags she had distributed to them contained items worth about $30, which could save them an estimated $160 over the next 12 months if used to the maximum potential. And if the audience members had no use for the items, she added, “Share the love, as we say,” by passing them along to friends or family members who could. The county was able to purchase the materials thanks to a grant it received about a couple of years ago, she noted. 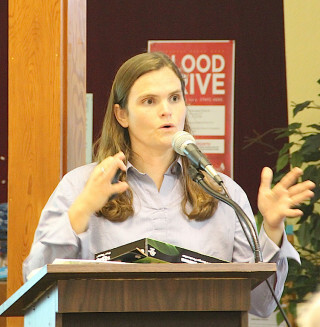 Byron, who is the sustainability manager for Sarasota County, talked at the outset of her 30-minute presentation about how much she enjoys going out into the community to help people make their homes more energy-efficient. The most important item in the green bags she distributed, she noted, was information. A booklet titled EnergySavers, published by the U.S. Department of Energy, is designed to explain strategies for home improvements and offer tips on how to talk with contractors, to ensure projects lead to greater energy efficiency, Byron explained. 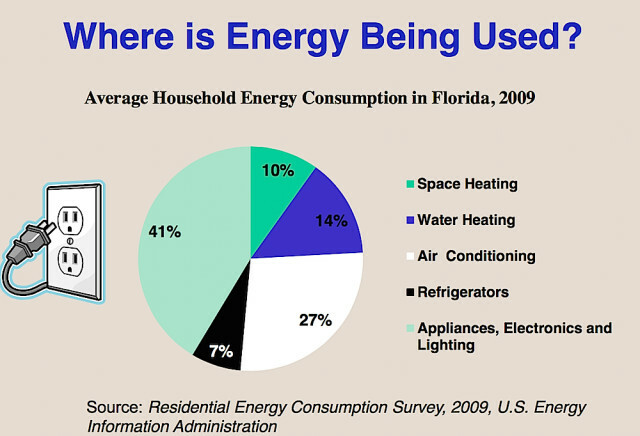 Moving on to a PowerPoint presentation, she told the audience, “In Florida, our biggest single energy user is air conditioning,” which accounts for 27 percent of household consumption. The next largest portion of demand is related to “what we call the ‘plug load,’” she continued: iPads, DVRs, computers — many devices that people did not even have 10 years ago. Appliances also make up part of that category, which accounts for 41 percent of energy usage, she added. Water heating creates 14 percent of the energy demand, she noted, and the biggest individual user among appliances is the refrigerator. Additionally, Byron suggested programmable thermostats, insulating drapes and Energy Star fans. Moreover, she said, people should remember to turn off fans when they leave rooms. It costs about $7 a month to keep a fan on constantly, she pointed out. Even though that is a small figure, Byron noted, it can add up. In regard to lighting, she continued, “The biggest bang for your buck” is produced by substituting compact fluorescent bulbs (CFLs) for incandescent ones. Three CFLs were in every bag distributed at the SKA meeting, she pointed out, and a homeowner should realize savings of almost $200 over the life of them. LED bulbs are even better, she said, as they do not produce as much heat. “They are still kind of expensive,” she conceded, though the prices are coming down. Turning again to water demand: Just as Energy Star appliances are more energy-efficient, she noted, WaterSense products lead to savings with toilets, faucets and showerheads. Another inexpensive device that will help in older homes is a faucet aerator, she continued, which raises pressure and decreases water flow. Each bag had two of those. Moving outside, figuratively speaking, Byron suggested Florida-friendly landscaping, turning off hoses whenever they are not in use and asking for an irrigation audit by a representative of the University of Florida/Sarasota County Extension staff, who will test for leaks in systems. After people turn off the lights at night, she pointed out, they can detect those “vampires” by noting the red and green twinkles around the house. Some of those electronics can be turned off, she added, while others — such as cable TV boxes and clocks — should remain on. Power strips are a great way to manage those situations, she noted; each bag contained one of those. 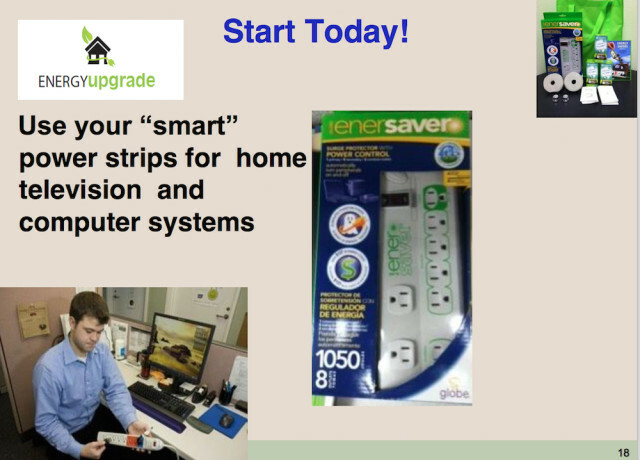 For example, a homeowner can plug the TV and its auxiliary equipment into a power strip, she continued, and then turn off the strip when the TV is not in use. Air leaks are another reason for higher energy bills, she said, noting that Florida Power & Light (FPL) will send a representative to a home to undertake a test for leaks; that costs $30. The cheapest items in everyone’s bag, she pointed out, were insulating gaskets that could be placed over light switches, behind the faceplates. Caulking — also in the bags — could eliminate even more leaks, Byron pointed out. The “second biggest bang for the buck” is insulation, she told the audience. Although the current building code minimum is R-19, she said, doubling that is recommended. 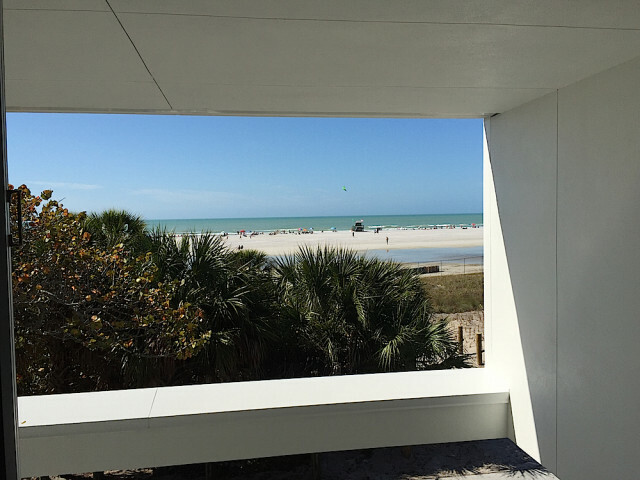 Likewise, while a SEER 14 rating is the minimum required for an air conditioning system under the Florida building code, she recommended buying a system with a SEER rating of 16 or 17. And while it is expensive to replace windows, if a homeowner is planning such a project, she pointed out, windows with Energy Star ratings for the Southern Region are another way to save money. Less expensive strategies, she added, are planting shade trees on the sunniest sides of houses and using awnings. Anyone wishing to learn about the latest ones available should check the website dsireusa.org, she added. 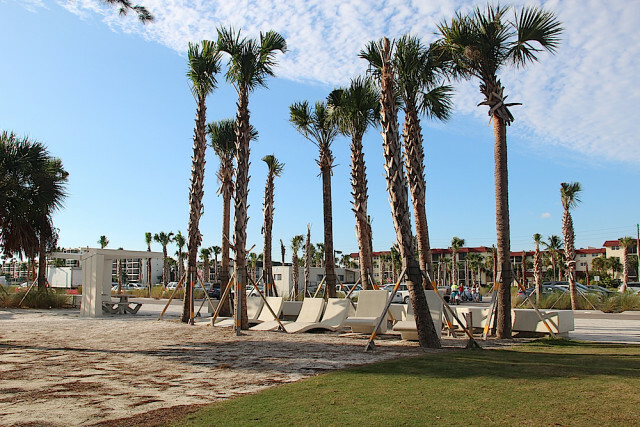 A question posed by Siesta Key Association Secretary Joyce Kouba led to some clarification this week about the palm trees planted in the new parking lot at Siesta Public Beach. Kouba told this reporter she recalled county commissioners having requested shade trees in that lot when discussions were under way about alternates that might be possible if the main elements of the park improvements project came in under budget. In August 2013, the commissioners considered how they wanted to rank the eight potential alternates presented to them. One of those was listed as “Tree Size and Species Upgrade,” at an estimated cost of $330,000. 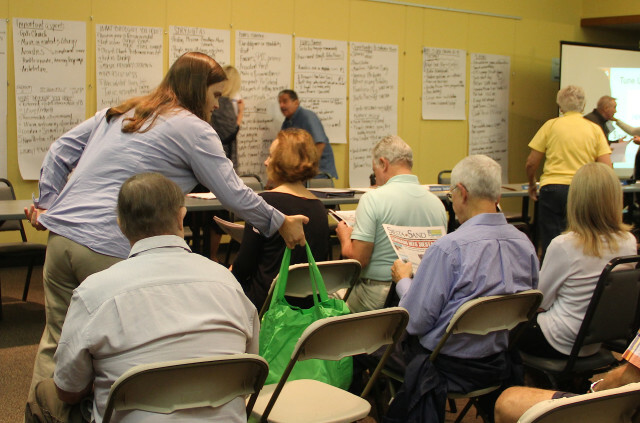 Project Manager Brad Gaubatz explained at the time that the proposal called for 64 green buttonwoods and 338 cabbage palms to be planted in the park and parking lots. With the upgrade, 5-inch buttonwoods could be used instead of 2-inch trees. “I’m for the larger ones,” then-Commissioner Nora Patterson said during that meeting. “There’s nothing uglier than somebody who did a parking lot and put in spindly little trees,” especially given the need for cooling, as asphalt gets so hot on sunny days. After further discussion, Commissioner Christine Robinson made a motion that passed unanimously: A revised Item 4 called for $190,000 for the tree upgrade for the park. A new Item 8 would be an upgrade for the new parking lot, at a cost of $140,000, The Sarasota News Leader reported on Aug. 30, 2013. On Feb. 17, county spokesman Jason Bartolone cleared up any remaining confusion. The tree size and species upgrade was incorporated into the park improvements (Alternate 4), he wrote the News Leader in an email. However, as reported by Gaubatz to the County Commission in November 2015, the decision was made not to increase the size of the palms in the new parking lot, because its landscaping was substantially completed at that point. Proceeding with Alternate 8 would have meant the replacement of hundreds of trees, Bartolone added. Speaking of the beach park improvements: On Feb. 16, Sarasota County staff led media representatives on a tour of the new facilities. While a News Leader reporter was unable to participate because of another engagement, county spokesman Jason Bartolone was kind enough to provide photos from within the new Public Safety Building at the News Leader’s request. 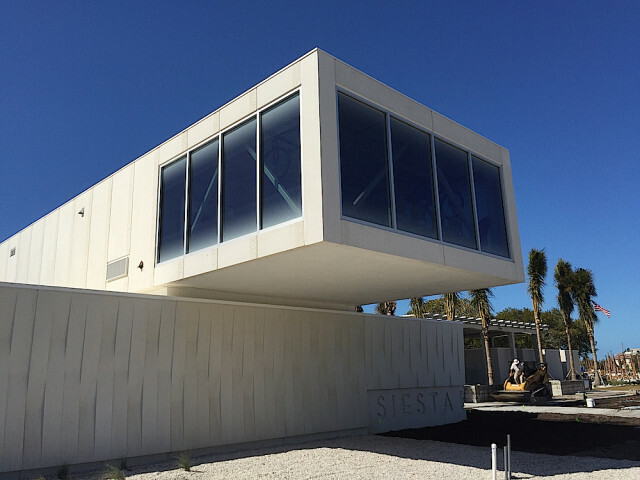 During a Jan. 7 presentation to the Siesta Key Association, county Project Manager Brad Gaubatz talked of the expansive views of the beach park from the upper level of that structure, which should prove of great assistance to Sarasota County Sheriff’s Office personnel as they maintain the peace for all beach users. 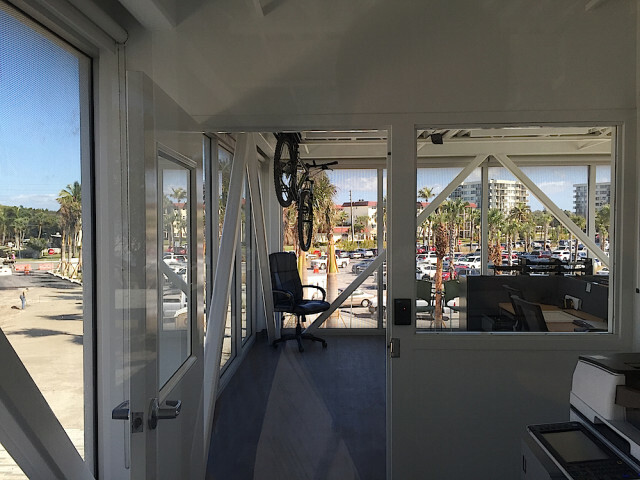 Additionally, visitors will have the opportunity to join a walking tour along the new esplanade “to see all of the amenities and learn more about them from guests stationed along the way,” the release notes. “The tour begins at 10 a.m., and participants can grab a special passport to be stamped at each stop, with an opportunity to win a prize at the end,” the release added.